Here is a series that defies all sequel logic as each entry just gets better and better, and with this movie being no exception, it's arguably the best of the three. It's the most satisfying of the bunch, and with that, is also the most satisfying thriller of the year. And that's amazing to be coming from a movie that has basically done the same thing twice already. It's still damn good, though, and in terms of pure heart-pounding, adrenaline-pumped excitement, this Bourne guy may very well have something on Mr. Bond. The film is under the very capable direction of Paul Greengrass ("The Bourne Supremacy," "United 93"), whose keen sense of urgency is intact with his purposely jittery camera work. This is a paranoia-filled world that Bourne finds himself running around in, and Greengrass does a superb job of capturing that tension. The action is fast-moving and zoomed-in with razor-sharp editing, and it's all held together by a pounding musical score. It's immediate, kinetic, and it drags you in from the very beginning with its burst of nervous energy that never lets up. We become involved, and we feel like every decision is truly as split-second as it appears on screen. Each movie is similar to this, transporting us to different locations all over the globe where we've watched Bourne run from assassins at every turn, and this time he's closer than ever to finding out about his past once and for all. So, why exactly is the CIA after him so relentlessly? As convoluted as it may seem, it's actually quite straightforward. There is a secret project still in existence named Blackbriar that descended from the original Treadstone organization which had ended. Jason Bourne is living proof that the CIA runs this murderous black-ops branch, which violates laws abroad and even in the United States. David Strathairn joins the cast as Noah Vosen, a man whose ruthless determination to save his own job turns quite deadly. He strives to assassinate Bourne and anybody else involved with him. Returning from the second film is Joan Allen as the strong-willed and determined Pamela Landy. Reluctant to go along with Vosen's methods, she believes that there's more to Bourne and that there's something to be said on his behalf. Julia Stiles makes a third return, as well, whose role as Nicky Parsons has gotten increasingly more important; this time, Bourne coincidentally hooks up with her in Madrid, and she somberly begins helping him out. 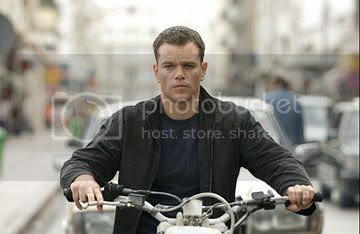 The "Bourne" movies have taken running and chase sequences from being plot elements and have turned them into the plot itself. There's a sequence in the impossibly crowded Waterloo station of London where Bourne is attempting to meet with a reporter with vital information. Meanwhile, Vosen is back at headquarters with up-close surveillance on his pursuers and their next move to eliminate that reporter. Later on, there's even a better chase in Morocco that takes place across the rooftops. It's when Bourne returns to New York City, though, that things really start to ratchet up. It's an intense game of cat-and-mouse being played in the Big Apple with plenty of jaw-dropping switchbacks and smooth escapes. It all leads up to a final confrontation with the shadowy man in Bourne's recurring memory; he allows the man to explain everything rather than just picking him off. In the "Bourne" tradition of car chases, this time we get not only one but two. There's one taking place on a motorbike through winding streets, but the big finish happens when, as the tagline states, Jason Bourne finally comes home. It's this final car chase in New York City that provides for the big finish; it's so breakneck fast and so blisteringly visceral that you won't believe it until it's happening. You feel every bump and bend as the vehicles crunch and tear apart, smashing up against anything in the way. The action feels even more free-flowing than ever before, and it feels like we're actually there in the moment. Yes, this is a franchise, but it's an ingeniously smart one. When I look at Matt Damon from now on, I will only see Jason Bourne; he has grown into the role with an ideal mix of toughness and vulnerability. And then putting Greengrass yet again into the equation elevates it even higher as he has now perfected the task at hand, making this "Bourne" film the most dazzling and riveting of them all. It's his masterful direction that makes this easily the best threequel anybody will come across all year. And this may not actually be the ultimatum it claims to be. Although Jason Bourne has been running for the past three movies, if this one's ending is any indication, he may have enough in him to continue on in yet another movie to tie up any loose ends.